Yesterday Hauggy got to go to work with me! 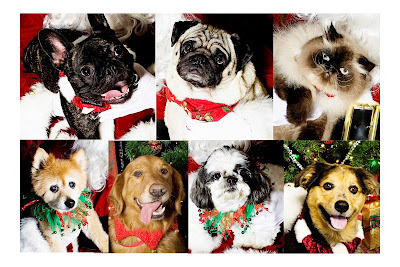 I volunteered at Laguna Hills Animal Hospital and took pictures of pets with Santa. My friend Nicole is the manager there and I can't so no to helping animals. Hauggy got his very own luxury sweet complete with a dog bed and his own TV tuned to the animal channel. However, he choose to lay on the hard floor right next to the door. He also got all of his vaccines updated and we took a DNA test to find out exactly what breed Hauggy is! How fun! I've always wanted to meet his parents and see what kind of dogs created him. We'll find out in a couple of weeks. Here are some of the cute little critters I hung out with all day! Haha! Yeah, Santa was a girl and wasn't totally into it. But, really, who would be? awwwww...how totally cute! 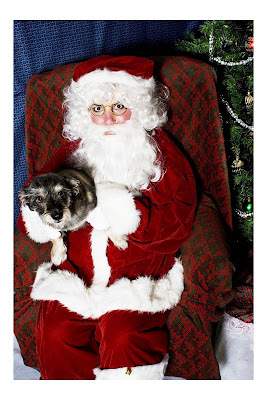 The Haugster looks adorable with Santa..btw, is that Santa wearing eyeliner??? lol! !